In Construction, Risk Management is a crucial key to efficiently manage projects while minimizing the chances of any unplanned events from occurring throughout the project’s timeline. We are aware that it is almost impossible to predict the future without any uncertainties. Therefore, we offer you a service that does not just identify those uncertainties but also mitigates their risks and impacts, in case they happen. Risk management enhances the ability to manage a project towards a successful completion that matches its objectives. At Pearls Construction LLC, our vast experience in the risk management process gives us a better understanding of the common risks that may arise during your project. Therefore, improving our chances of finding the optimal way of resolving those risks and minimizing any probability of their future reoccurrences. Effective and efficient risk management at the early stages of the project ensures its successful completion; meeting the project’s objectives and staying within time and budget. Risk identification: This is a process that identifies the risks that a project is prone to as early as possible. It is carried out throughout the whole project’s timeline yet gets the most focus during the important milestones. 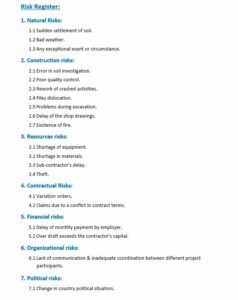 Risk identification includes risk resources and risk categories. Risk Analysis: This process analyzes the impact that the identified risks might have on the project’s objectives. The analysis of the risks is used to qualify and quantify the consequences that the risks may have on the project’s outcome; then figures out how to resolve them correctly to keep the project on track. Risk analysis includes risk probability, risk severity, risk exposure, etc. Risk Response planning: After the analysis of each risk, a set of actions must be taken in order to mitigate them; whether on a short or a long run. Therefore, with the agreement of the owner, an action plan should be implemented to reduce the risks to the minimum. Risk Response planning includes Risk response plans, risk triggers, risk ownership, etc. Risk Monitoring and control: This process includes identifying new risks, monitoring old ones, reclassifying them, and reporting them. It helps us know where the project stands risk-wise and whether we need to take any further actions or not; with the help of reports to monitor and control any risks. Our team is very well aware of how challenging risk management can be to your project. Therefore, we promise to offer you an exceptional quality service that consists of strategic plans to deal with all possible risks; ensuring correctly resolving them and reinforcing ways to avoid them further in the project’s timeline.